You are the captain of a space vessel that has become lost in an asteroid field. It turns out the asteroids were actually the deadly Space Fire Birds. Now you must try and avoid being destroyed by the giant creatures. 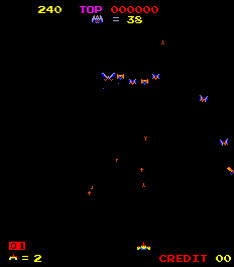 Fire Birds fly on to the screen and move around in complex patterns, spraying bullets and firing missiles that explode into fragments. You have to destroy a certain number of Fire Birds to clear each stage. Your ship can move left and right and shoot. You can also use your Warp Shields to boost across the screen, destroying everything in your path.